I remember hearing Elisabeth Elliot speak in college. The packed room filled with women and a few men as I sat towards the back with a few friends. Passion and Purity ranked high among the must-reads of my college crowd at the time. I thought it a strange book…a bit over the top. Now, she stood telling me she thought girls should wear skirts. I’m sure I smirked. Now, 16 years later I still hold to a different view on skirts but I sit more and more often at the literary feet of Elisabeth Elliot. I liken her to a spiritual grandmother, a little old-fashioned in some areas but consistently delivering piercing truth. Truth pierces the heart and draws me into closer fellowship with the Lord…when I listen well…I, the young granddaughter of the faith. These Strange Ashes, A Chance to Die, and now The Path of Loneliness rank at the tops of my list for the beginning Elisabeth Elliot mentee. Meat for the soul I call them. These Strange Ashes recounts Elisabeth’s first year on the field and it still speaks to what one can expect the first year on the field. I lend my copy out and make it clear I expect it back! 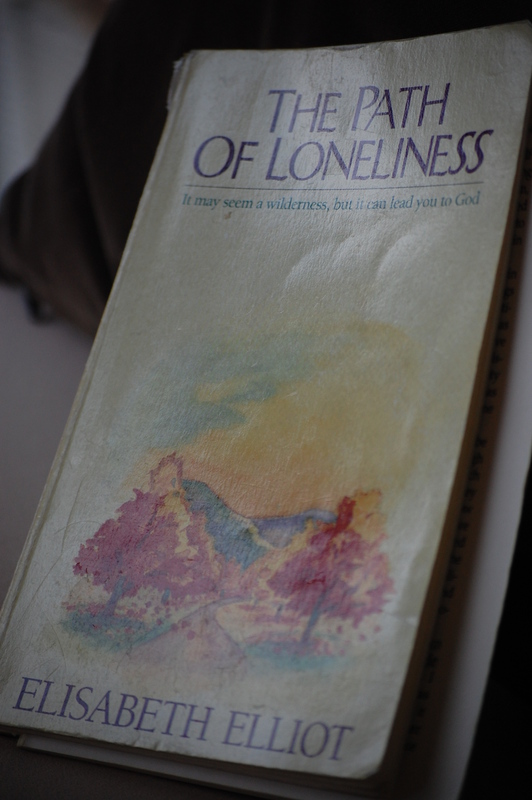 The Path of Loneliness required me to choke down a destructive mental barrier as I saw it on a friend’s shelf this past week pondering what book to borrow. I don’t like to tell people when I am lonely. I even wanted to hide this book while I read it instead of leaving it on my side table! Ahh…pride! Today I finished the book and I just might start at the front and read it again copying down favorite passages. I might end up copying the whole book. I do plan to buy a copy… plus a few to give away as I feel led. Passion and Purity…well…I still need to go back and pick that one up again and rethink it. I read Elisabeth Elliot now expecting to feel the rub and pull involved in taking a vigorous hike towards greater trust and obedience to the Lord. As with any hike, the anticipation and joy of the summit compels more strongly the farther I get on the hike. What author or book challenged you lately? I was a big Elisabeth Elliot fan back in the day. I wrote her a letter after reading one of her books and she wrote back. I think I still have that letter. Lately, I’ve been challenged by Brene Brown. I was in a group this spring that read one of her books on shame. That is a letter I’d save too. I heard some about Brene Brown and am interested in reading her book on shame. I’ll put it on my kindle list! Thank you for the reminder. John Eldgredge’s book, Waking the Dead. He challenges us to figure out what we were designed to do by looking at the arrows we’ve received through those around us. These wounds give a good indication of our purpose. That sounds like a good one! Pain shapes us, hopefully in the direction of compassion, conviction, and greater love as we open up our wounds to the Healer.